Posted December 20, 2006 in 2 Fox, 2006/12, Early Jack Kirby, Periods, Serial Posts, z Archive. At the same time Jack Kirby drew his first comic book feature for Fox Comics he also created The Solar Legion for TEM Publishing. Jack did not sign this work, most likely he did not want to draw Victor Fox’s attention to his moonlighting. Work for The Solar Legion is a good match for what Jack did on Cosmic Carson, a good story, lots of action (particularly using spaceships), and good artwork. 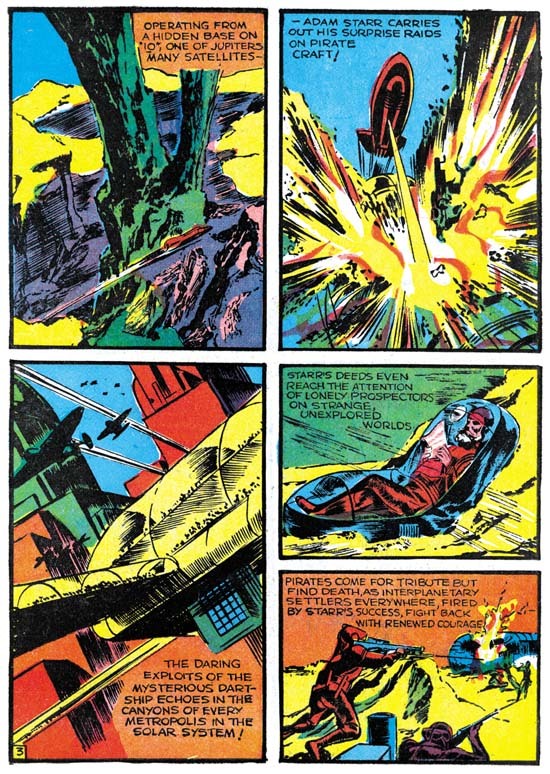 Kirby continues to use larger and irregularly sized panels. There seems to be a lot more emphasis on long distance views, often in exaggerated perspective, then Jack would use in his later years. The inking is the also the same, the spotting was mostly done to define form and does not play much part in the overall design. 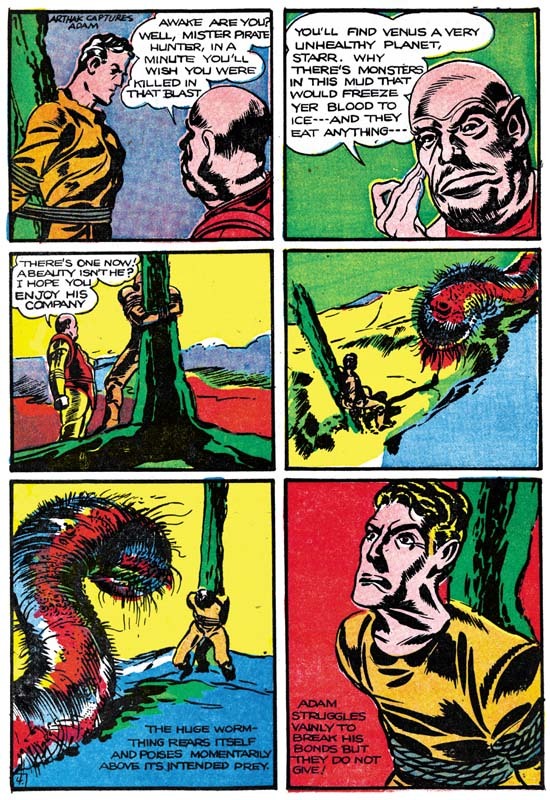 One thing Jack was able to do for the first time in The Solar Legion was to draw various monsters. Besides the giant worm in the image above, there was also giant serpent like creature. Jack would create Solar Legion stories for the first three issues. Although some sources attribute to Kirby the feature in Crash #4 and #5 this appears to be incorrect. 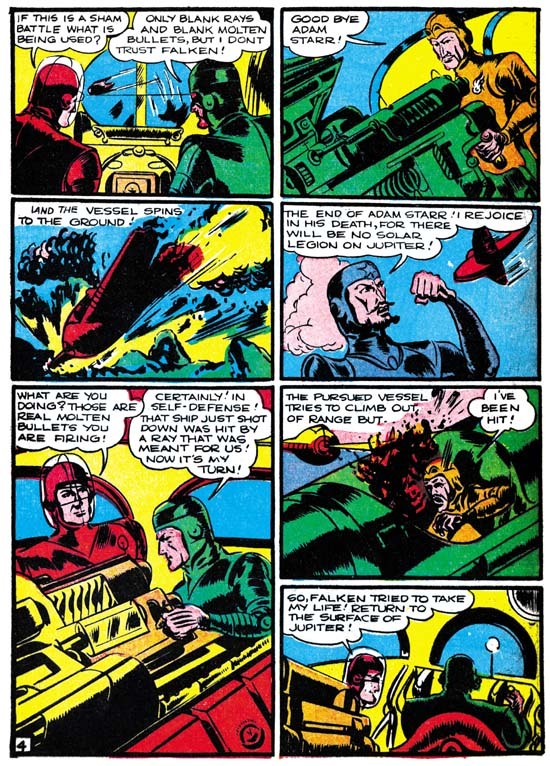 You can see in the image above from issue #5 that the artist tried to imitate Kirby, however with very limited success. July finds the return of Lightin’ and the Lone Ride to Famous Funnies. You may remember that previous installments were, like all the other features in the comic, reprints of syndicate strips. Jack had completed one story line but the second one was neither finished or published. Now when Jack Kirby returns to the Lone Rider he starts an all new story. But this new installment is very different from the previous one. The most obvious is that the story made of three rows of panels. When the story is read it clearly was not made for syndication publication. The plot paces not one strip at a time, but rather one page at a time. This story was clearly made for publication in the comic book. 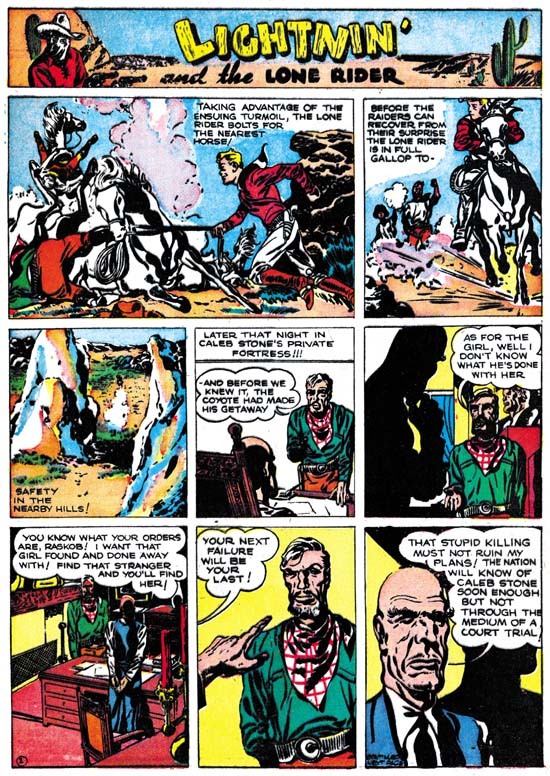 The artwork is much more advance from the first appearance of Lightin’ and the Lone Rider. The Blue Beetle strip art is closest to this later Lone Rider. Particularly in the inking and the use large areas of blacks as part of the design or for depicting a character in silhouette. However the depiction of action it clearly more advance then in the Blue Beetle. This all suggests that the art was started while Jack was still at Fox Comics but not long before he left. 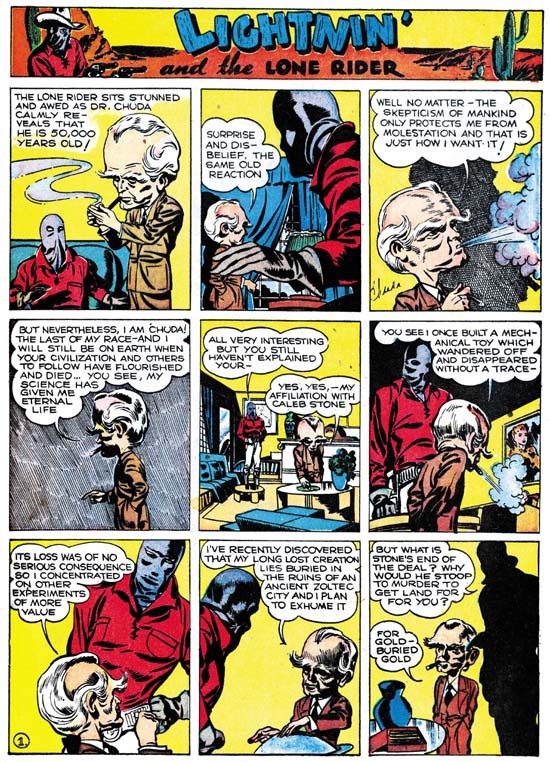 Kirby introduces into the Lone Rider story a character type that he would return to, in one form or another, thoughout his career, a small bodied man with a big head. As in the Blue Beetle, Jack has orchestrated an interesting story that he never finished. Jack leaves us completely unclear where he was going, let alone how he would end it.